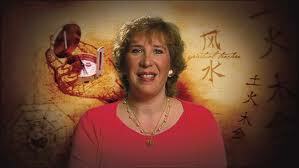 You may recall Marie Diamond, the Feng Shui expert in The Secret. She is the one who had the French painter replace his portraits of women with paintings of couples, so he could attract a relationship. Sorry, couldn't find the clip. Marie Diamond is an extremely enterprising woman. Rather than question where Marie Diamond is on the internet, it would be easier to ask where she is not. She has been a very busy lady, building up her reputation and business as a feng shui consultant, author, radio personality, coach and purveyor of products. She works with A-list celebrities, large corporations, and regular Joes. This is one woman who has not been resting on her laurels since participating in The Secret. On the contrary, she's milking it and putting it to good use for self-promotion. Marie does a ton of interviews and was one of the speakers in the 2011 Tapping World Summit. She's on TV, internet radio, the stage as a motivational speaker, personal consultant, corporate consultant, writer....I'm sure there's probably more. Fellow teachers from The Secret, Bob Proctor and Jack Canfield, have both had Diamond do Feng Shui consultation or work for them. It's not only about financial success, though. Marie Diamond is the founding member of the Transformational Leadership Council; a founder and faculty member of Humanity Unites Brilliance (HUB); as well as the creator of Women Enlightened Leaders, a.k.a. W.E.L. Circle. Marie Diamond's first book, The Very Simple Law of Attraction, has been published in English and Dutch. Her next book is due to be released soon and is titled, Inner Universe-Outer Universe. Aside from The Secret, Marie has been featured in The Power of Mentorship (2007) and The Compass (2009). Wish I had this lady's energy! Think I need to do a bit of Feng Shui, myself. The list goes on....and on....and on! There were several others that have been taken down as well, the links led to error pages, or expired offers. Below is a video of Marie Diamond on Star! Daily. They introduce her after a few seconds.